Out of Home Advertising, Advertising in Gyms, Advertise in Waiting Rooms | PlayMyAd, Inc.
Why Advertise at College Campuses? 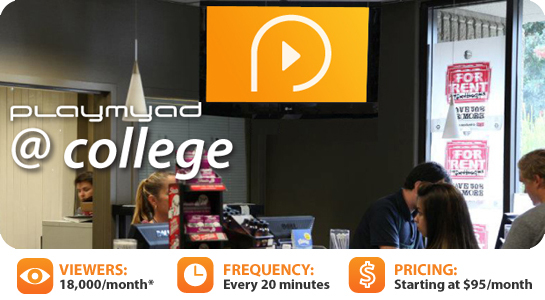 The PlayMyAd College Network can deliver your commercial to a targeted and profitable student audience through ad placement on college campuses, including in college stores and gyms. 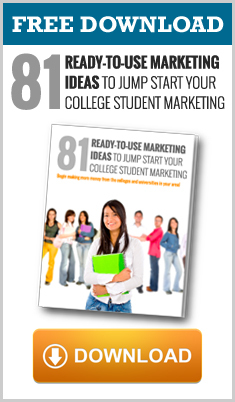 By advertising to college students you can enjoy years of loyal purchasing by reaching students while their buying preferences are being formed. Are There Benefits to Targeting the PlayMyAd Inc. College Network? When you choose advertising on college campuses with PlayMyAd Inc., we can ensure that your message is received by your target audience, from a college campus to the local grocery store. Call us today and find out how you can get started with your local targeted advertising campaign! What Businesses Can Benefit from PlayMyAd Inc.’s College Network? Call the experts at PlayMyAd Inc. today at 888-411-6923 to speak with one of our local marketing consultants who can help you with marketing to college students and developing a successful advertising campaign. How Can PlayMyAd Inc. Help Me Advertise to College Campuses? It Is an Affordable Investment - Small- and medium-sized businesses that need to make every advertising dollar count should consider gaining access to our large networks. We offer a range of competitive pricing so that any business can start advertising in at least one of our networks for as low as $55 a month! You Can Tap Into Local Marketing Expertise - Our local marketing consultants can provide critical guidance and support in choosing your target audience so you can achieve the best results. You Have a Range of Creative Talent at Your Disposal – Few business owners know much about making the best possible ad. That is why PlayMyAd Inc. offers access to creative talent that can help you make an engaging and effective commercial. Our clients are constantly amazed by how quickly and easily we produce a great commercial for their business. You can be too! You Can Save Time – By using our patent-pending technology, location-based TV advertising has never been easier to create and distribute. We will help you choose your target venue, create your ad and ensure that it is played frequently at your chosen target venues. No matter what venue you choose, PlayMyAd Inc. can help you create an effective advertising campaign. Does PlayMyAd Inc. Track the Results of My Advertising Campaign? Create a unique incentive for your commercial that you can use to identify its effectiveness. For example, if your target audience is college students you can offer a 20 percent discount on your products or services with a valid student ID. When a customer asks about the discount you will know they saw your commercial. It is proven that campaigns that include an incentive or discount will drastically outperform campaigns that do not. If you need help developing an idea for an incentive, call our experienced and friendly customer service team at (888) 411-6923. Tell your employees that you are offering a promotion. If you do not they may refuse to give the discount. 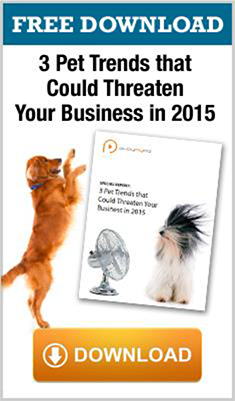 This will reflect badly on your business and could lead to a loss in customers and bad reviews. To properly track how the promotion is redeemed you can use high-tech or low-tech options. For a high-tech option, create a special "promotion code" to issue the discount. This will keep a record of how many times the code is used which can allow you to track your ad’s effectiveness. A low-tech option is having your employees ask how your customers heard about you. Regardless which way you track your results, you will see how many customers received the discount.